This bilingual poetry collection (English and Fijian) fuses sea creatures, myths and themes from around the Pacific. Daren Kamali is a Pacific performance poet, musician, writer and co-founder of the South Auckland Poets Collective. He is of Fijian, Wallis and Futuna ancestry, now living in New Zealand. Daren was awarded the Fulbright-Creative New Zealand Pacific Writer’s Residency in 2012. Tales, Poems and Songs is his first collection. ISBN 978-0-47318-780-4, 1600 x 2250mm, pb, colour illus, audio cd, 92pp. 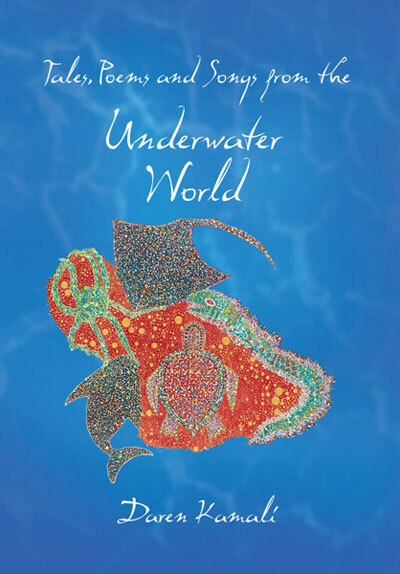 “Kamali’s poetry is a genuine if naïve attempt to connect the ancient Pacific Islander cultures to the twenty-first century peoples who have migrated, mainly to New Zealand and Australia. It is therefore a truthful attempt to reconnect displaced people to their original roots while reaffirming their presence in other lands and settings, and as such, it deserves attention.” —Jorge Salavert, Transnational Literature. *We regret this title has now SOLD OUT.